Today, Saturday February 24, he returns to the fray with the conference that he gave this morning in Sydney, organized by University of Notre Dame of Australia. In it, Fr. Weinandy describes and denounces the attack of unprecedented gravity that some of the “pastoral” theories and practices encouraged by Pope Francis are carrying out against the “one, holy, Catholic, and apostolic” Church and in particular against the Eucharist that is “source and summit” of the Church’s very life. Fr. 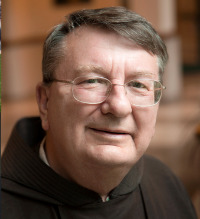 Weinandy, 72, is one of the most widely known and esteemed theologians, and lives in Washington at the Capuchin College, run by the Franciscan order to which he belongs. He is still a member of the international theological commission that supports the Vatican congregation for the doctrine of the faith, having been appointed to it in 2014 by Pope Francis. He has taught in the United States at various universities, at Oxford for twelve years, and in Rome at the Pontifical Gregorian University. Granted the post-Vatican II Church was rife with divisions – disputes over doctrine, morals and the liturgy. These disagreements continue still. However, at no time during the pontificates of John Paul II and Benedict XVI was there ever any doubt as to what the Church teaches concerning her doctrine, morals, and liturgical practice. […] Such is not the case, in many significant ways, within the present pontificate of Pope Francis. […] At times it would appear that Pope Francis identifies himself not as the promoter of unity but as the agent of division. His practical philosophy, if it is an intentional philosophy, seems to consist in the belief that a greater unifying good will emerge from the present bedlam of divergent opinions and the turmoil of the resulting divisions. My concern here is that such approach, even if unintentional, strikes at very essence of the Petrine ministry as intended by Jesus and as continuously understood by the Church. The successor of St. Peter, by the very nature of the office, is to be, literally, the personal embodiment and thus the consummate sign of the Church’s ecclesial communion, and so the principle defender and promoter of the Church’s ecclesial communion. […] By seeming to encourage doctrinal division and moral discord within the Church the present pontificate has transgressed the foundational mark of the Church – her oneness. How, nonetheless, does this offense against the Church’s unity manifest itself? It does so by destabilizing the other three marks of the Church. Firstly, the apostolic nature of the Church is being undermined. As has often been noted by theologians and bishops, and most frequently by the laity (those who possess the "sensus fidelium"), the teaching of the present pontiff is not noted for its clarity. […] As seen in "Amoris Laetitia", to re-conceive and newly express the previously clear apostolic faith and magisterial tradition in a seemingly ambiguous manner, so as to leave confusion and puzzlement within the ecclesial community, is to contradict his own duties as the successor of Peter and to transgress the trust of his fellow bishops, as well as that of priests and the entire faithful. Secondly, […] the universality of the Church is visibly manifested in that all of the particular Churches are bound together, through the college of bishops in communion with the pope, by professing the same apostolic faith and by preaching the one universal Gospel to all of humankind. […] This mark of catholic oneness is also presently challenged. The first issue […] pertains specifically to holiness. While one must profess the Church’s one apostolic faith, faith itself is insufficient for receiving Christ in the Eucharist. Referencing Vatican II, John Paul II states that “we must persevere in sanctifying grace and love, remaining within the Church ‘bodily’ as well as ‘in our heart’” (Ecclesia de Eucharistia 36). At the beginning of the Second Century, Ignatius, made this same point – that one can only receive communion “in a state of grace” (Ad. Eph. 20). Thus, in accordance with the Catechism of the Catholic Church and the Council of Trent, John Paul confirms: “I therefore desire to reaffirm that in the Church there remains in force, now and in the future, the rule by which the Council of Trent gave concrete expression to the Apostle Paul’s stern warning when it affirmed that in order to receive the Eucharist in a worthy manner, ‘one must first confess one’s sins, when one is aware of mortal sin’” (ibid.). In accordance with the doctrinal tradition of the Church, John Paul, therefore, insists that the sacrament of Penance is “necessary for full participation in the Eucharistic Sacrifice” when mortal sin is present (ibid. 37). While he acknowledges that only the person can judge his or her state of grace, he asserts that “in cases of outward conduct which is seriously, clearly and steadfastly contrary to the moral norm, the Church, in her pastoral concern for the good order of the community and out of respect for the sacrament, cannot fail to feel directly involved” (ibid.). John Paul intensifies his admonition by quoting Canon Law. Where there is “a manifest lack of proper moral disposition,” that is, according to Canon Law, when persons “obstinately persist in manifest grave sin,” they are “not to be permitted to Eucharistic communion” (ibid.). Here we perceive the present challenge to the Church’s holiness and specifically the holiness of the Eucharist. The question of whether divorced and remarried Catholic couples, who engage in marital acts, can receive communion revolves around the very issue of “outward conduct which is seriously, clearly and steadfastly contrary to the moral norm,” and, therefore, whether they possess “a manifest lack of proper moral disposition” for receiving communion. Pope Francis rightly insists that such couples should be accompanied and so helped to form properly their consciences. Granted that there are extraordinary marital cases where it can be rightfully discerned that a previous marriage was sacramentally invalid, even though evidence for an annulment is unobtainable, thus allowing a couple to receive communion. Nonetheless, the ambiguous manner in which Pope Francis proposes this pastoral accompaniment permits a pastoral situation to evolve whereby the common practice will swiftly ensue that almost every divorced and remarried couple will judge themselves free to receive Holy Communion. This pastoral situation will develop because moral negative commands, such as, “one shall not commit adultery,” are no longer recognized as absolute moral norms that can never be trespassed, but as moral ideals – goals that may be achieved over a period of time, or may never be realized in one’s lifetime. In this indefinite interim people can continue, with the Church’s blessing, to strive, as best as they are able, to live “holy” lives, and so receive communion. Such pastoral practice has multiple detrimental doctrinal and moral consequences. First, to allow those who are objectively in manifest grave sin to receive communion is an overt public attack on the holiness of what John Paul terms “the Most Holy Sacrament.” Grave sin, by its very nature, as Ignatius, Vatican II and John Paul attest, deprives one of holiness, for the Holy Spirit no longer abides within such a person, thus making the person unfit to receive holy communion. For one to receive communion in such a, literally, disgraced state enacts a lie, for in receiving the sacrament one is asserting that one is in communion with Christ, when in actuality one is not. Similarly, such a practice is also an offense against the holiness of the Church. Yes, the Church is composed of saints and sinners, yet, those who do sin, which is everyone, must be repentant-sinners, specifically of grave sin, if they are to participate fully in the Eucharistic liturgy and so receive the most-holy risen body and blood of Jesus. A person who is in grave sin may still be a member of the Church, but as a grave-sinner such a person no longer participates in the holiness of the Church as one of the holy faithful. To receive communion in such an unholy state is, again, to enact a lie for in such a reception one is publicly attempting to testify that one is a graced and living member of the ecclesial community when one is not. Second, and maybe more importantly, to allow those who persist in manifest grave sin to receive communion, seemingly as an act of mercy, is both to belittle the condemnatory evil of grave sin and to malign the magnitude and power of the Holy Spirit. Such a pastoral practice is implicitly acknowledging that sin continues to govern humankind despite Jesus’ redeeming work and his anointing of the Holy Spirit upon all who believe and are baptized. Jesus is actually not Savior and Lord, but rather Satan continues to reign. Moreover, to sanction persons in grave sin is in no manner a benevolent or loving act, for one is endorsing a state wherein they could be eternally condemned, thus jeopardizing their salvation. Likewise, in turn, one is also insulting such grave-sinners, for one is subtly telling them that they are so sinful that not even the Holy Spirit is powerful enough to help them change their sinful ways and make them holy. They are inherently un-savable. Actually, though, what is ultimately being tendered is the admission that the Church of Jesus Christ is not really holy and so is incapable of truly sanctifying her members.